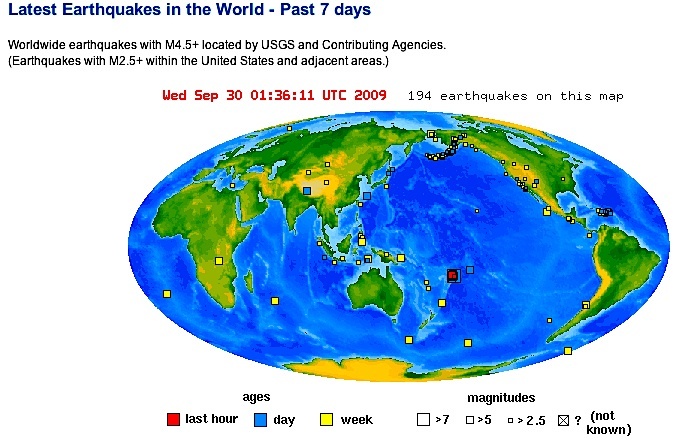 An 8.2 earthquake is a significant event on this Planet. One just hit Indonesia within the last few hours. and a second Tsunami warning has been issued. Lets hope that there is no resulting Tsunami. 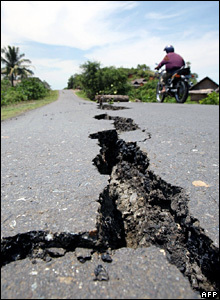 the Indian Ocean region and Australia after a powerful earthquake in Indonesia..."
"In December 2004, a powerful 9.1 earthquake triggered a tsunami off the coast of Sumatra island that killed over 160,000 people in Indonesia's Aceh province." "After the December 2004 tsunami, a tsunami alert system was put in place to warn people of potential tsunamis. The Indonesian presidential spokesman Andi Mallerangeng says the system seems to be working." "Back on December 26th, 2004, a powerful 9.1 earthquake triggered a tsunami off the coast of Sumatra Island ..."
You know Geno. . . I've thought about these things a lot, being by the ocean. There is a huge fault line offshore, that runs parallel to the beach here in the San Diego area. I always told my son, since he was little, that if ever the water recedes, don't get curious. . . get the hell out of there, and head for very high ground. . . don't look back. . . look to take pictures. . . or any of that bs. . . just keep moving on up. I used to dive. . . doing environmental studies, etc. I've seen that falult line. . . WOW what a drop. Very frightening underwater. The power of just a foot of water, especially moving very quickly is mind boggling. There's nothing within our general comprehension that alerts us successfully to how this "little wave" can be such a killer. Even the videos that you posted, can't really capture why it's so devastating. It's unfortunately something that has to be experienced first hand to be believed. Great post, Gene. You did it AGAIN!! Some Tsunami waves can reach speeds in excess of 100 miles per hour. They can be a foot high, or 100 feet high. If you have ever tried to pick up a 5 gallon can of water, you know how heavy 5 gallons of water is.A One square foot container contains over 7 gallons of water. One square foot=seven gallons. is a mile long. The energy contained in this wave is staggering. Yes, the power of water flowing or moving is a nearly unstoppable force, and imagine the long waveforms that these waves travel in are moving at up to 500 miles per hour. Frightening! Relief teams are assessing the damage on Indonesia's island of Sumatra which was hit by two massive earthquakes. At least nine people are known to have been killed and some 40 injured in the undersea tremors and a series of aftershocks on Wednesday and Thursday." "Tsunami warnings were repeatedly issued and lifted, as many people ran inland fearing a repeat of the 2004 tsunami..."
so they just lay flat on the road"
"I used to dive. . . doing environmental studies, etc. I've seen that fault line. . . WOW what a drop. Very frightening underwater. I do remember You telling me about this before, it must be awesome to see and "feel" while diving, and in light of the potential that this fault has the power to do... frightening. I hope for all of us that it remains as dormant as possible for a very long, long time! WELLS, Nev. (AP) � Windows shattered and building facades and signs fell, but no one was seriously injured when a powerful earthquake shook this rural northeastern town on Thursday. I didn't feel it here in San Diego. I wonder if Soul Sister got rocked in Las Vegas. ...this one happened back on the 19th, also. "A moderate earthquake occurred at 2:41:29 PM (PST) on Tuesday, February 19, 2008. The magnitude 5.0 event occurred 25 km (15 miles) NW of Guadalupe Victoria, Baja California, Mexico." Geno... The link isn't working. 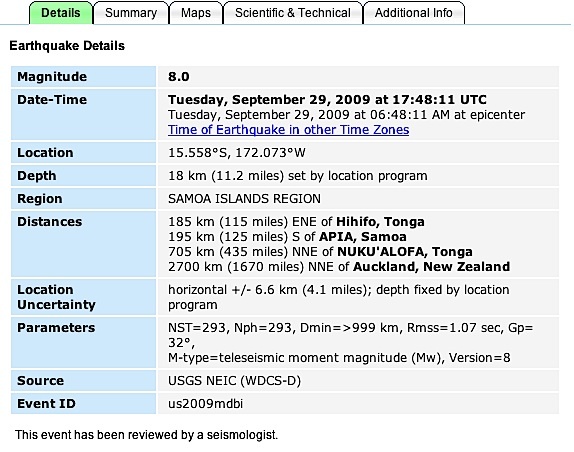 It appears that some of the quake info is harder to find after "7 days" has passed... Go figure! ... and... may they ALWAYS be small ones! Great Info here, and this is interesting too! "Below is a clickable map of southern California, with epicenters of historic earthquakes (as far back as 1812) ..."
I had fun playing around with those links. We must be in a pretty safe pocket here. i agree with You... that is exactly what it seems like where You are... all around Ya, but not "directly" there. 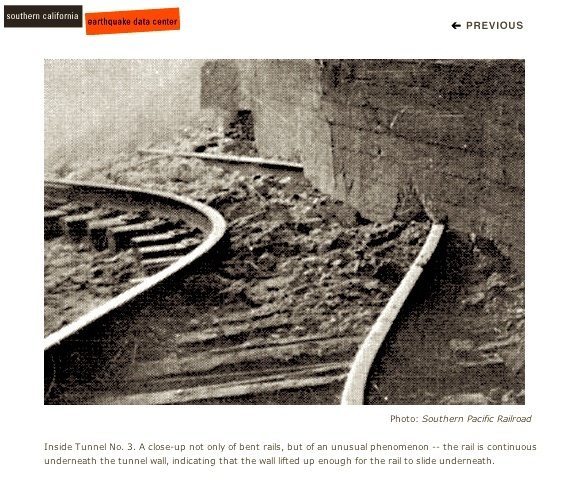 and wow... look at the pictures in this black & white slide show here of the railroad tracks and tunnel. Amazing. 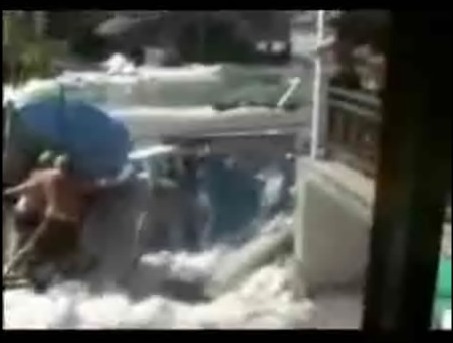 I think Samoa has been hit by a tsunami!! WOW!! 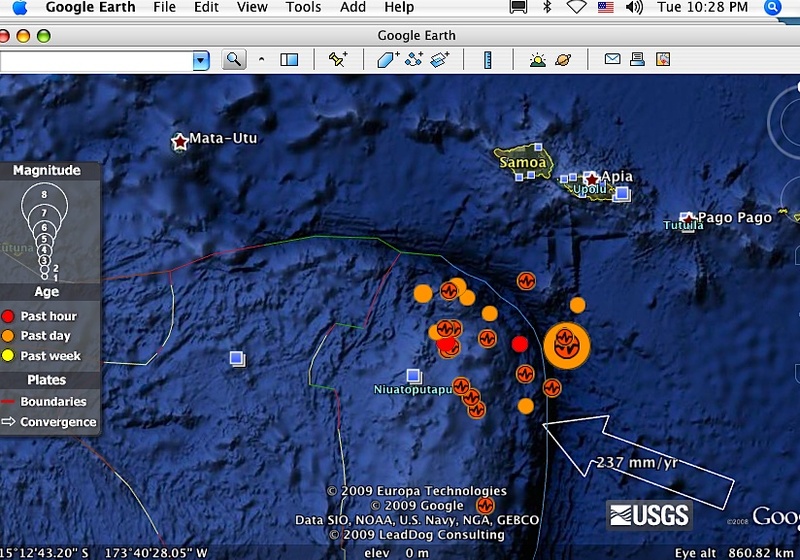 American Samoa has really been hit! Ths will probably affect a lot of areas... Fiji... and other Islands. The 8.3 earthquake lasted for 3-5 minutes. OMG! 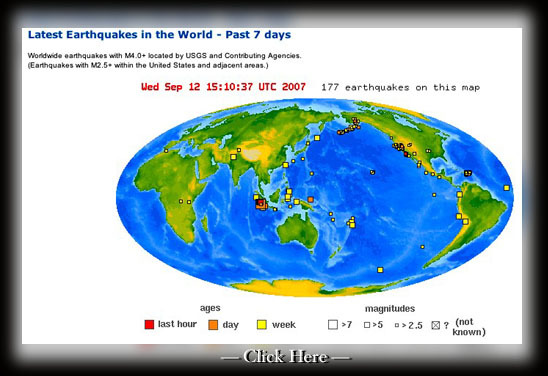 Display real-time earthquakes and plate boundaries in Google Earth (requires version 4+). 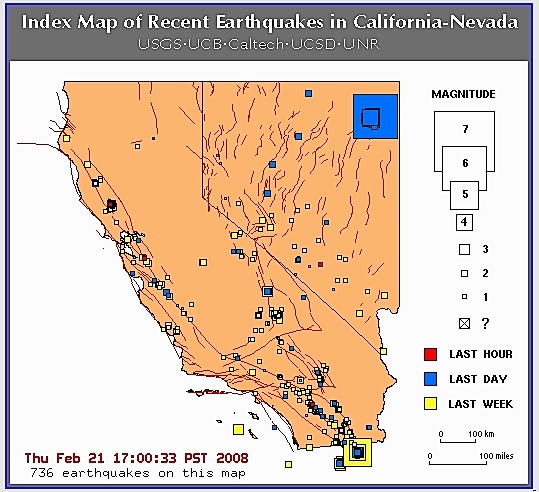 To display earthquakes, download one of our earthquake KML feeds (below) and open it in Google Earth. Earthquakes refresh every 5-minutes. More Google Earth files � "
And it has all of the usual "Google Earth" zoom in/zoom out functionality!